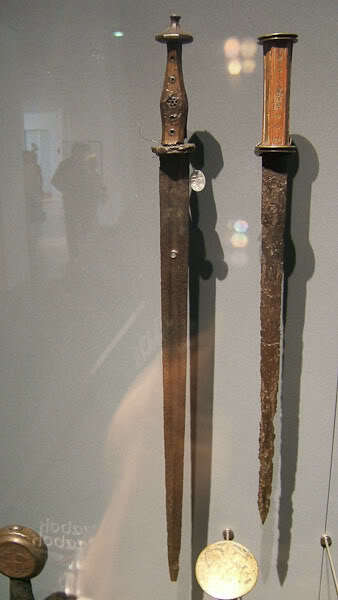 There are a number of long daggers that survive from the 14th and 15th centuries. By long, I mean approaching or reaching 2 feet or more in overall length. I've heard it mentioned that these are weapons of archers, billmen, and other people who wouldn't be armed with a sword. So, they're not necessarily knightly weapons by that line of thought. Is there any evidence (pictorial or otherwise) for the use of these by people who would also be armed with a sword? I don't know of any evidence of it shown in any paintings or fight manuals about that length of blade being used in conjunction with a sword. The only famous figure that I know of using one was Fiore dei Liberi. 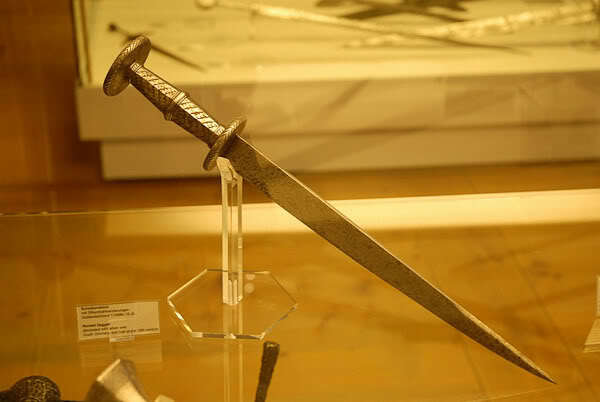 I imagine the advantages are great, having a blade thats long like a short sword, and the speed and faness of a dagger. 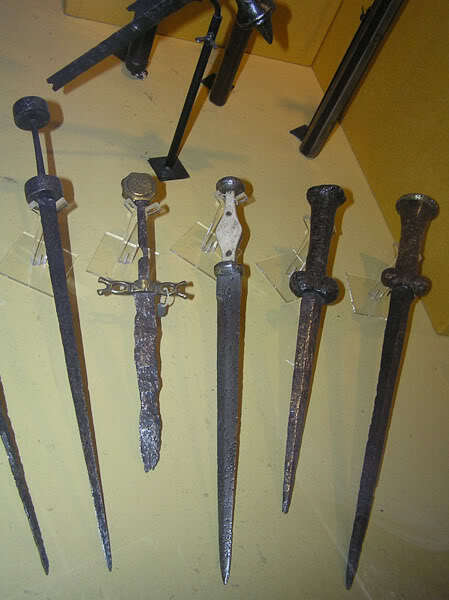 There is also some variety in long daggers: Cinquedea, long Rondels, Baselard, Coustille, Kindjal, Dirk, . By design, form or tradition I guess some extremely long ones are still called daggers but just my way of looking at it anything over 20" long is really getting into the short sword to sword length by whatever name one calls them. Generally being lighter and faster than a sword of the same length blade might be a criteria to still call then daggers I guess ? But getting past definition splitting of hair the subject seems interesting. Also maybe short sword in length but lighter and less of a hindrance for someone carrying a polearm or a bow or crossbow as their primary weapon than a sword. I don't know if one would want such and extremely long dagger if one was already carrying a sword but a still large 15" blades dagger might be more useful ? A long Rondel might be useful as a backup for a sword as it's more effective against armour than the sword in many ways as a specialized tool/weapon. Thanks for the input, guys! I should have been more specific. I'm not really interested (for the purpose of this thread) in items made both in dagger lengths and sword lengths like cinquedeas or baselards. 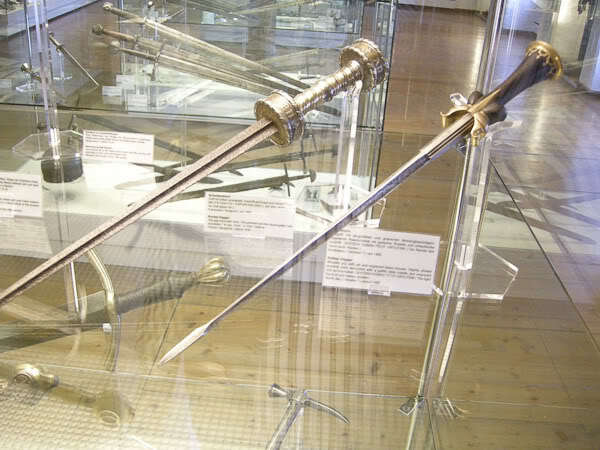 I'm also not talking about any of those fecthbuch daggers with extra-long hilts. The vast majority of the examples I've seen have been rondel daggers. Those are what I'm most interested in. Stiborici Stibor, Transylvanian voivod, etc in the time of King and emperor Sigismund of Luxemburg. If you look at the images on Imareal for the gruesome theme "Bethlehemitischer Kindermord" you get all kinds of soldiers with long knives. Usually the ones with the knives don't have swords. Interesting stuff. I have often pondered these pieces and the more general topic of arms choice in period. As an example if you are an armored combatant and have a pole hammer you would not carry a sword as well most likely but would want a side arm. Thats my theory for these types. It would also explain there use by Irish warriors armed with axes and spears. I think at times it's a question that as collectors we tend to want to in theory carry around every weapon we have because we just can't bear the thought of not carrying a favourite sword + polearm + sidearms + buckler + crossbow + ........ everything we would like to have. Now, a rich Noble or Knight would have servants to carry all this inventory and pass to him the optimum weapon for the optimum situation. ( The golf caddy simile. ). If travelling one might carry a few extra weapons if possible but when on the battlefield one would have to consider the practical negatives of a large sword at ones waist while fighting with a polearm as the sword could get in the way at a critical time where any small distraction like tripping over the scabbard could be lethal even if it just distracted one for a fraction of a second. Also, running, leaping, being as agile as possible would also influence on much " hardware " one would want to carry at the same time. A long dagger or a small axe/warhammer/mace + maybe a buckler would not get in the way of the use of a long polearm and when things go to very close work the smaller compact weapons would be better choices to go to first rather than a sword. But I think that spare weapons would go into the baggage with everything else soldiers would need to carry on campaign unless just walking to a close by " harassing/raiding " the neigbours. Note: Small low bulk, low weight weapons like a smaller dagger would not be an issue but one of preference and how many weapons one likes to have on one's person. ( I know that I would like a small dagger or two or three slipped into a boot top or hidden if captured, if being ransomed didn't seem more probable and desirable than trying to escape ). Most of the time people on the depictions wearing (or using) very long knives and daggers are not shown in war or similar large scale engagement. I know that themes of these kind of religious paintings are quite in favour of showing various guards (at the tomb of Jesus, attacking various martyrs...), but the depictions of "knights" with such long knives are rare. Would a mounted knight carrying a longsword, a lance and a normal length rondell dagger change all those for a longer dagger if he chose to fight on foot with the pollaxe? I doubt it. I think those long knives are more of a civil weapon, where longsword or even a one handed sword would be an "overkill". That would include knights in civil clothing (some of these longer daggers are really noble and expensive weapons). Various guards are also often in a position when they don't have to carry a lot of "firepower", and their weapons could also be quite fancy (reflecting the status of their employee). 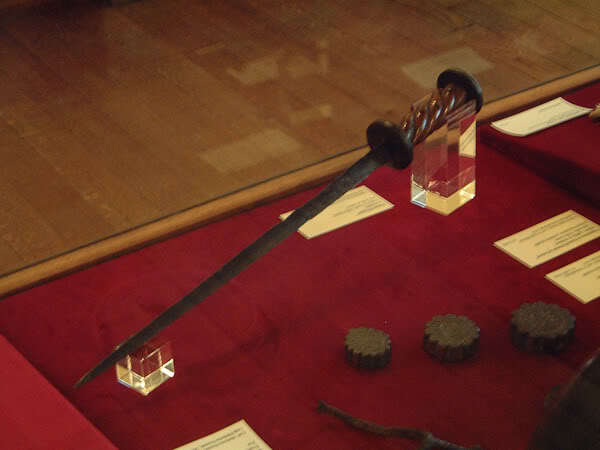 There is also possibility that these very long daggers are a way of circumventing various laws regarding carrying swords in some places (inside towns, inside buildings). fascinating topic! I have seen the long bladed rondel dagger in the spotlight topic and found it very interesting. Do we have any more pictures of historical examples other than in period art? 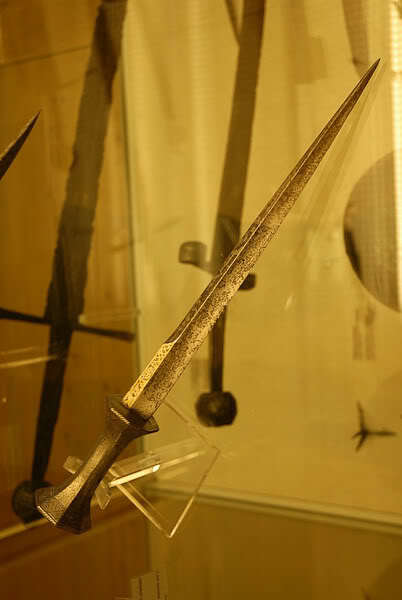 An examples of long bladed quillon daggers like slender short swords? Here are some "longish daggers" I found after a quick look. I don't have the dimensions for most of the daggers (or other info, apart from museum), and some are perhaps shorter than they appear (if they have slender blades and hilts). Here are two examples from the Museo Nazionale del Bargello. They are just under 60 cm in overall length. 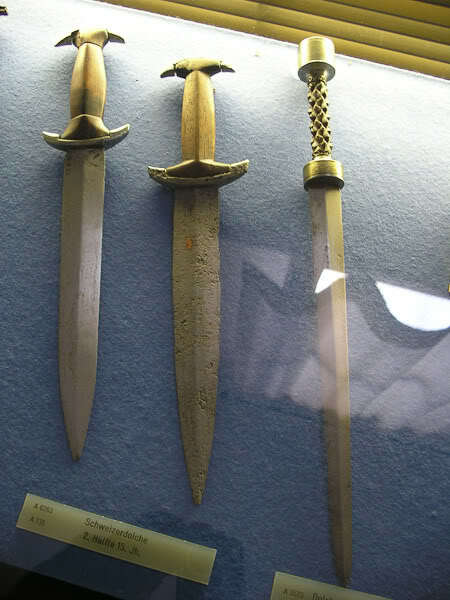 The cataloguer couldn't decide if the first one was a dagger or short sword. Thanks for all the pics. It's appreciated. Thanks for bringing up good points. I think common sense might say it's not practical to wear a big dagger and a sword, but then there's that slab of Stibor Stiboric of Beckov. It certainly doesn't seem to have been common. 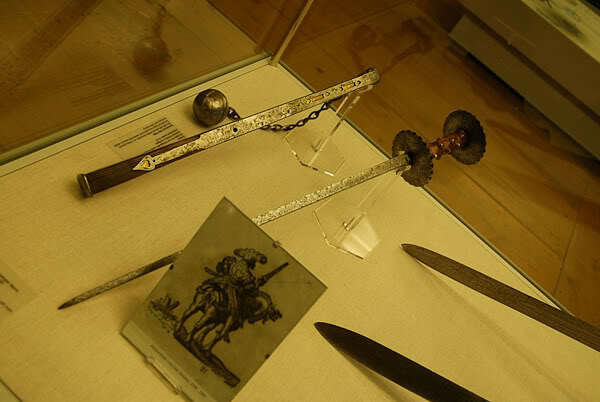 These are very few extant examples of the Russian 16th c. long daggers, called Podsaadachny Nozh, i.e. the Under-Saadak Knife; saadak being a quiver for arrows and the bow. 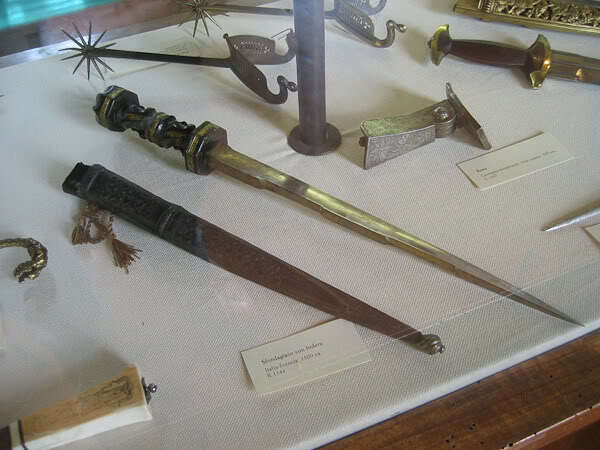 The knife pictured below belonged to Prince Andrei Ivanovich Staritsky, ca. early 1500s. Total length 52 cm, blade is 44 cm. 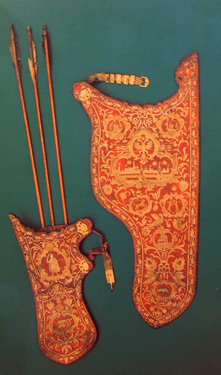 Saadak pictured below belonged to Tzar Alexei Mikhailovich Romanov, the father of Peter The Great. The knife [a dagger, really] would have been attached on a belt underneath it. 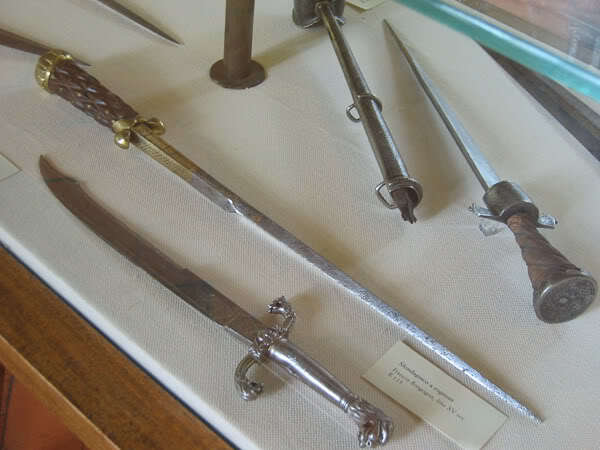 Going a little outside the desired period you find that Swetnam recommended carrying a two-foot dagger and four-foot rapier while Smythe complained about soldiers bringing overly long daggers (with "ale-house" hilts) to war. He considered a blade between nine and ten inches with a minimal cross to be ideal. 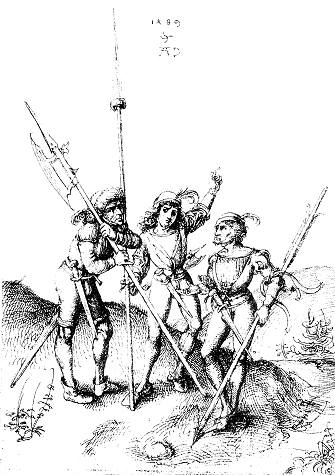 Albrecht Dürer, Drei Kreigsleute, 1489, has three soldiers armed with ELDs. One has a sword as well (and a polearm as his primary weapon). Swiss daggers could be very long. Some soldiers in the picture have both dagger and sword.